You are here: Home / Plumbing / What Is Plumber’s Putty? Do you have plumber’s putty at your disposal? Here’s why it’s a good tool to have for your DIY projects or to patch a pipe while you wait for a professional. Fixing the leaks in and around the home can save around 10% on your water bill. That doesn’t sound like much, but those savings really add up. Not sure where to start? The best place is with one of the most common tools professional plumbers use. Plumber’s putty can help fix the leaks that spring from plumbing fixtures around the home. Plumber’s putty is moldable putty that can be worked into shapes once you warm it between your hands. It has a clay base with vegetable or mineral oils to help it stay malleable. It won’t harden, shrink, dry out or crumble. This makes it perfect to seal plumbing fixtures, although it’s not good on pipe threads. One advantage putty has over sealants like silicone is it lets you more easily take the plumbing components apart afterward. The putty stays pliable. Plumber’s putty is not like Teflon tape. Teflon tape seals from the outside. It’s a good option if the pipes are under high pressure. “Dope” is slang for pipe-joint compound. It comes in a jar and has a consistency of mashed potatoes. Pipe-joint compound keeps a pasty texture and never hardens, although it can become flaky or brittle. Its soft consistency makes it perfect for coating pipe threads. Leaks are one of the most common plumbing problems. Plumber’s putty seals the parts to prevent leaks. A common location for leaks, and thus putty, is around toilets and drains. Putty also helps seal the drains for sinks and tubs. Don’t use putty to seal pipe threads. It has the wrong consistency. Do not use it seal anything that experiences high water pressure. Be careful around marble and granite countertops. If the putty has oil in it, don’t use it. Silicone or a water-based version should be used instead. There’s plumber’s putty specifically designed to be used with stainless steel. 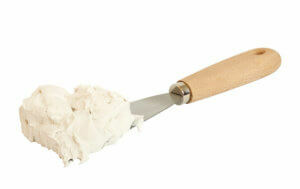 As one of the most common plumbing tools, putty can be found at any hardware store. Most stores carry at least one kind. If there’s one marked as “stain free,” it should be safe for most materials. Take some of the putty from its container. It will be cold and hard. Don’t worry, it’s not a bad batch. You just need to work it a bit so it heats up. Roll it in your palms and work it into a ball. A quick, firm motion will help generate heat. Continue until it’s stretchable and can be pulled like putty. Once the putty is softened, stretch it until it’s the size needed for the area that needs leak protection. This could mean a long snake-like piece or it might be flat. What’s important is it covers the area. Make sure the surface is clean. If it’s not, use a little soap and water. Dry it well because plumber’s putty won’t stick to wet surfaces. Spread the putty around the surface. If it’s a drain, make it a circle without gaps. But don’t create multiple layers. This isn’t when more is better. Use your fingers to press the putty firmly into place. Once the putty is firmly in place, re-assemble the drain or fixture. Tighten the bolts so everything is secured. Excess putty will ooze from the area. Use a rag, sponge or towel to wipe it up. Use warm soapy water to clean up and assure there are no putty traces. Does plumber’s putty sound and like too much work? That’s OK, you can leave plumbing to the professionals. At Eyman, they’re experts at when and how to use plumber’s putty. These pros have solved South Omaha’s plumbing problems since 1957. Don’t want to tackle that plumbing project? Hire the professionals at Eyman to get the job done right. Call (402) 731-2727 to schedule service or consultation today!